A Caucasian young female born at term weighing 3.4 kg, presented to her general practitioner at 4 weeks of age and repeatedly after that with cough, fever and “noisy breathing”. She was treated with multiple courses of oral antibiotics. 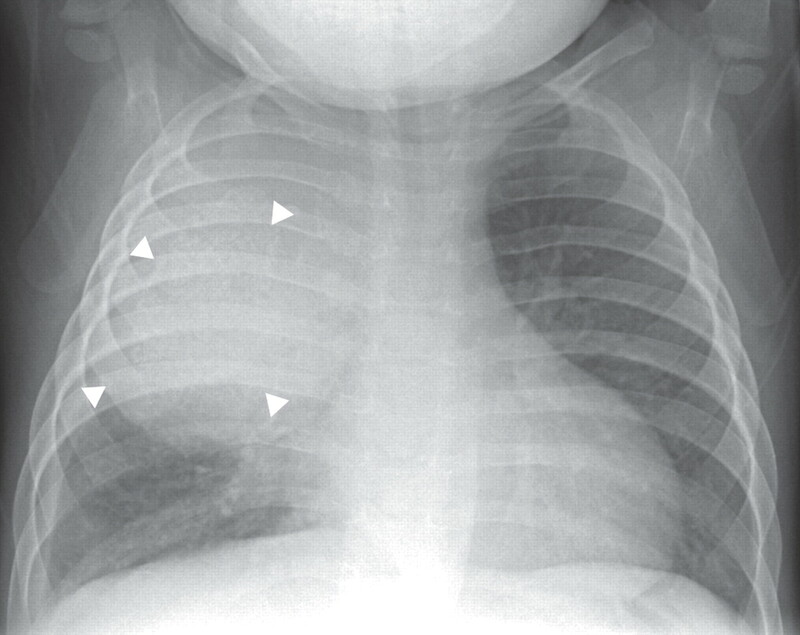 The symptoms persisted, and at 6 months of age a chest radiograph (CXR) showed dense consolidation affecting the right upper lobe. She was admitted to her local hospital for a course of intravenous antibiotics. The patient was afebrile on admission and oxygen saturation was 96% in room air, but she had mild respiratory distress and tachypnoea. Auscultation of the chest revealed scattered crepitations and transmitted sounds. Haematological indices and inflammatory markers were normal. She was an only child, born to unrelated parents who were heavy smokers. Immunisations were up-to-date and she was developing normally. Weight gain was along the 50th centile for the first 6 months but had dropped down towards the 25th centile since weaning had started. There was no other family history of note. After 2 weeks of intravenous antibiotics she remained afebrile but continued to have mild tachypnoea and a cough with persisting CXR changes. A computed tomography scan (CT) of the chest (fig. 1⇓) and flexible bronchoscopy were performed 1 month after initial presentation to the local hospital. Bronchoscopy demonstrated an anatomically normal right upper lobe with partially occluded segmental bronchi. There was no microbial growth from bronchoalveolar lavage. A contrast enhanced chest computed tomography scan obtained at 7 months of age showing a large mass lesion (arrowheads). A: anterior mediastinum; M: middle mediastinum. At 10 months of age she was referred to a tertiary hospital for children for a surgical opinion and was admitted for an elective excision of the mass. A pre-operative CXR (fig. 2⇓) and magnetic resonance imaging (MRI) of the chest were performed (fig. 3⇓). A right postero-lateral thoracotomy was performed to explore the mass 1 week later. 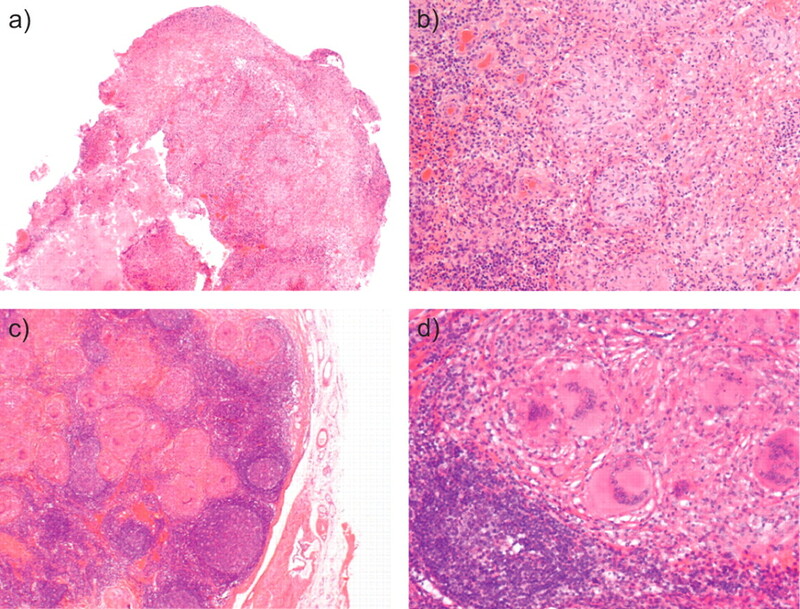 Histopathological findings of the surgical specimens are shown in figure 4⇓. A pre-operative chest radiograph showing faint amorphous calcification (arrowheads). A contrast-enhanced T1-weighted image. Central parts of the right upper lobe are occupied by more ovoid structures that are darker (arrowheads). #: trachea. Photomicrographs of the surgical specimens. a, b) Fragments of partially necrotic material from the main mass with peripheral viable areas showing granulomatous inflammation (haematoxylin and eosin). c, d) Lymph node showing massive involvement by caseating granulomata with numerous multinucleate giant cells. (haematoxylin and eosin). Mycobacterium stains were negative. BEFORE TURNING THE PAGE, INTERPRET THE PATIENT'S HISTORY, CT SCAN, CXR, MRI CHEST AND HISTOPATHOLOGY FINDINGS, AND SUGGEST A DIAGNOSIS. The CT chest scan (fig. 1⇑) shows a large mass lesion extending from the right lung apex into the anterior mediastinum and more inferiorly into the middle mediastinum. The mass has a heterogeneous appearance, some areas of faint stippled calcification and much cystic change. There is no definite fat within this mass. Likely diagnosis: germ cell tumour. The pre-operative CXR (fig. 2⇑) shows a large soft density mass occupying the upper and mid-zones of the right hemithorax, extending to the pleural surface and abutting the mediastinal surface and right heart border. Within this, faint amorphous calcification is seen. There is a small amount of right pleural fluid. Most likely diagnosis: germ cell tumour. The pre-operative MRI of the chest (fig. 3⇑) shows that the right upper lobe is highly abnormal. Most of the lung is bright, which is suggestive of fluid accumulation and/or oedema associated with inflammation. Central parts of the lobe are occupied by more ovoid structures that are darker. The signal characteristics are nonspecific but could be in keeping with solid elements of a neoplastic process, as well as (partly) devascularised elements of a low-grade primary inflammatory process. Similar elements are seen in the mediastinum closely related to the trachea. Based on this, germ cell tumour seems less likely and primary inflammation or high-grade neoplasm is more likely. Dissection was difficult as the extrapleural and intrapleural planes were obliterated by inflammation. A large tense multicystic mass was found filling the entirety of the right upper lobe. A large central cyst containing necrotic caseous material was found in the mass. The cyst was deroofed and a large quantity of caseous purulent material was drained. Massive mediastinal lymphadenopathy with some necrotic nodes was seen and a specimen was sent for histopathological examination (fig. 4⇑). Diagnosis: Pulmonary tuberculosis with mediastinal involvement. The purulent material from the mass showed acid fast bacilli on Ziehl-Nielsen staining. The day following surgery a Mantoux test was performed, which was positive with an induration of 13 mm after 48 h (the child had not previously received Bacille Calmette-Guerin (BCG) vaccination). Isoniazid, rifampicin and pyrazinamide were commenced. PCR for Mycobacterium tuberculosis (MTB) was positive on the purulent material. The patient suffered from complex partial seizures 6 days after surgery. A CT scan of the head showed several focal calcified and enhancing leptomeningeal regions. Calcific foci were present within the right thalamus and left lentiform nucleus. Appearances were thought to be compatible with, but unusual for, tuberculosis (TB). Ethambutol and prednisolone were added to the treatment regime. Cerebrospinal fluid biochemistry and microbiology, including mycobacterial culture, was unremarkable. Fully sensitive MTB was isolated on culture from the purulent material and tissue from the lungs. Contact tracing did not uncover any TB contacts. The patient received four anti-tuberculous drugs under oral prednisolone cover (weaned over 6 weeks) for 2 months and two drugs (isoniazid and rifampicin) for a further 10 months and made an uneventful recovery. An immunological work-up was performed when the patient had recovered. She did not have further seizures, weight was above the 50th centile and complete radiological resolution was seen on CXR at 1-yr follow up. The present case highlights the delayed diagnosis of a common disease due to an uncommon presentation. The differential diagnoses considered were germ cell tumours particularly teratoma, neuroblastoma and an infected congenital cyst. However, some of these were ruled out on further investigation. In view of the clinical stability of the patient and initial radiological features, the primary pre-operative diagnosis considered was an intrapulmonary teratoma. Experience with intrathoracic teratomas in the paediatric age group is limited. Such tumours, particularly when arising from the mediastinum, appear to be predominantly benign in infancy and commonly symptomatic, with signs of respiratory distress or air way compromise 1, 2. In retrospect the delay of several months from presentation to surgery in the study patient could potentially have led to a progression to malignancy in a teratoma, with subsequent metastases. In such cases, a more rapid progression to surgery would be advised, although at present the risks of delayed intervention cannot be definitively stated. Ultimately the extensive mediastinal lymphadenopathy seen on the MRI scan was not compatible with a teratoma and a decision was made to explore the mass with probable upper lobectomy. Teratomas comprise of tissue from one or more germ layers. The majority of intrathoracic tumours arise from the mediastinum. Cough is a common presentation of intrapulmonary teratoma, with most cases presenting in the third and fourth decade of life 3. Typically, intrapulmonary teratomas are found in the upper lobes, with smooth margins and often with areas of intratumoural calcification on CXR. Typical CT findings are of a heterogeneous mass with soft tissue, fat, fluid and calcium attenuation 4. Experience with MRI is limited at present 5. 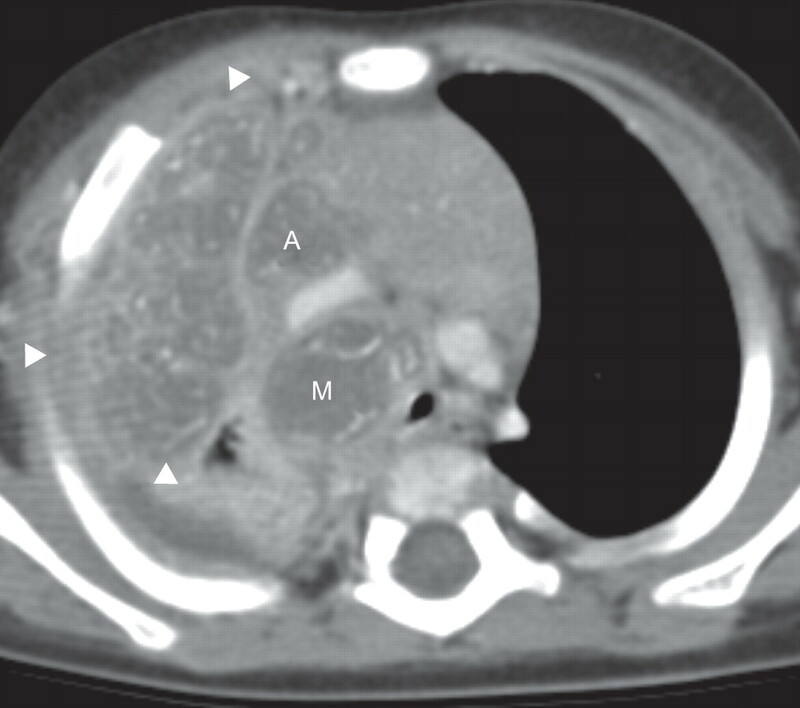 No previous case report has described pulmonary TB resembling an intrathoracic teratoma. Whilst on the rise, the incidence of active pulmonary TB infection in the UK paediatric population remains low. However, incidence is higher in certain urban areas, in particular London which accounted for 43% of TB notifications in 2003, a trend evident across Western Europe as a whole 6. The British Paediatric Surveillance report on paediatric TB in the UK reported 551 notifications between December 2003 and January 2005, with 33% arising from London. Of these cases, 115 (30.6%) were <3 yrs of age. The overall incidence of paediatric TB nationwide was estimated as 3.0 per 100,000 children, with an incidence of 2.0 per 100,000 in those <1 yr of age, 7. The most common symptom of active pulmonary TB disease in childhood is cough. This is a common presentation in childhood, and one with a broad differential diagnosis. As the incidence of active pulmonary TB in infancy is low, diagnosis may be delayed unless a high index of suspicion exists. This is particularly true in children with no history of TB contact, in areas of low incidence and low-risk ethnic groups, such as in the present patient 8. Pulmonary TB disease in infancy tends to arise from primary infection, rather then reactivation of dormant TB. Asymptomatic infection appears to be more common as children grow older 9. The diagnosis of pulmonary TB in children relies upon an integrated approach combining imaging, microbiological and blood assay testing, along with the tuberculin skin test (TST). The National Institute for Health and Clinical Excellence (NICE) published guidelines for the investigation of suspected pulmonary TB in the UK in 2006 10. CXR remains the initial investigation in the diagnosis of suspected active pulmonary TB, followed by sputum sampling. In childhood, gastric washings may be used if sputum induction is not possible, although bronchoalveolar lavage may be necessary to obtain definitive microbiological confirmation. Treatment should not await microbiological confirmation in strongly suspected cases where interferon testing can provide a result more rapidly. CXR remains the most common imaging modality in the investigation and diagnosis of paediatric pulmonary TB, as supported by the most recent NICE guidelines. Lymphadenopathy is the most common abnormality seen, typically involving the hilar, subcarinal and paratracheal regions. Parenchymal abnormalities are less frequently seen in primary TB, and are very rarely seen in the absence of lymphadenopathy. In children <3 yrs of age there is a higher prevalence of lymphadenopathy, and a lower prevalence of parenchymal abnormalities 11. Parenchymal involvement is common in progressive primary and in reactivated pulmonary TB. The roles of other imaging modalities are not clearly defined, and may arguably have been superseded by emerging interferon testing. A CT scan is generally reserved for the investigation of suspected cases when CXR is normal or equivocal. A CT scan may show parenchymal nodules of varying size, possibly with cavitation, or in the shape of peripheral intralobular nodules or tree-in-bud configurations suggestive of endobronchial spread. Areas of ground-glass change suggest active parenchymal inflammation. Miliary TB is suggested when nodules of uniform size are seen throughout both lungs. A CT scan is also more sensitive for mild calcific change 12. A number of case series have demonstrated the superiority of CT scans over simple CXRs in the detection of lymphadenopathy and also in the diagnosis of miliary TB 13, 14. The subcarinal region is the most common area where lymphadenopathy is found, with “ghost-like” enhancement rather than discreet ring enhancing with a low-density centre, as described recently 15. In adult patients, certain findings seen on high-resolution CT are associated with smear positivity, namely air space consolidation, cavitation and ground-glass opacity 16. Whilst MRI plays a key role in the evaluation of TB of the spine, brain, meninges and abdominal viscera 17, its role in pulmonary TB is yet to be established. 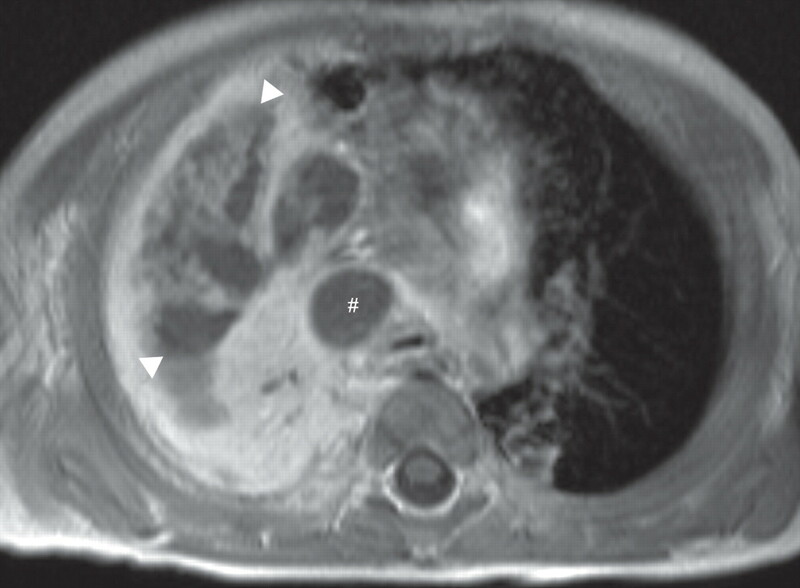 MRI may be useful in the diagnosis of tuberculoma in patients presenting with a solitary pulmonary nodule 18, and can also be used in the investigation of TB disease affecting the chest wall. A Chinese study of 55 adult patients with pulmonary TB concluded that MRI offered no extra information compared with CXR, and recommended no routine diagnostic role 19. MRI has been used in the experimental setting to track the progression of pulmonary TB in an animal model, with the suggestion that this approach could be used in a clinical setting 20. In contrast to the adult population, obtaining a positive mycobacterial culture in childhood is difficult. Gastric aspirates have a higher sensitivity then bronchoalveolar lavage 21, using the two in conjunction offers a higher diagnostic yield 22. The induction of sputum in children has not been considered as a useful method for obtaining microbiological confirmation, but studies have demonstrated the feasibility of such an approach 23. The application of PCR-based methods to sputum samples may further improve the sensitivity and specificity of mycobacterial testing 24. Tuberculin is a glycerine extract of the tubercle bacilli. In the standard Mantoux test, 0.1 mL of 100 TU·mL−1 of the purified protein derivative of tuberculin is injected subcutaneously. The resultant area of induration is assessed 48–72 h later, with <6 mm being negative, >6 mm showing a positive result and > 15 mm being strongly positive. However, the interpretation of the TST is complicated by the potential for false positives with previous BCG vaccinations or cross reactivity with nontuberculous mycobacterial infection. False-negative results may also be obtained in the setting of HIV infection or other immunosuppression, or in the presence of overwhelming mycobacterial infection. Current NICE guidelines do not include the TST in the investigation of suspected active TB, but rather as a first-line investigation for latent TB in patients who have not received BCG vaccination. Increasingly attention has turned to T-cell-based diagnosis and in particular T-cell interferon-gamma release assays (TIGRA) for the diagnosis of TB 25. TIGRA testing has been demonstrated to distinguish positive TST results caused by nontuberculous disease in adults and children 26. In the investigation of suspected latent TB in childhood, a degree of discordance has been demonstrated between TST and interferon testing: positive interferon testing with negative TST 27. The QuantiFERON-TB interferon testing has been shown to be superior to TST in the investigation of a pulmonary TB outbreak in a primary school 28. Current NICE guidelines recommend interferon-gamma testing in the investigation of latent pulmonary TB as a primary investigation in individuals aged >35 yrs who have received the BCG vaccination and a second-line investigation in patients with a positive Mantoux test. It is unusual for TB to present as a large pulmonary mass. Endobronchial TB lesions arise from discharge of a cavitating lesion with subsequent hypersensitivity reaction that may evolve into a pulmonary mass. TB presenting as an endobronchial mass initially mistaken as a possible malignancy, radiological or macroscopically, has been reported 29. Endobronchial TB may also present as an inhaled foreign body, particularly in the paediatric age group 30. Virtual bronchoscopy has been used to assess endobronchial involvement in childhood pulmonary TB 31. Lung abscess secondary to TB is uncommon outside of the developing world. A large Spanish case series of 252 patients reported no cases 32. A report of 27 patients with lung abscess in South Africa found that seven (21%) were due to TB 33. None of these patients had clinical features suggestive of TB. In retrospect, it is debatable whether early investigations for TB would have avoided the protracted course and need for surgery in the study patient. The Mantoux test performed post surgery was positive in the present case, although arguably this investigation was unnecessary as the presence of acid fast bacilli on Ziehl-Nielsen staining was sufficient to confirm a diagnosis of pulmonary TB. To conclude, in the infant presenting with a cough, particular care must be taken in identifying the symptoms both at initial presentation and at follow-up. This case serves to remind that TB may present in unusual ways. The respiratory paediatrician must remain vigilant, as the key step in the diagnosis of tuberculosis in its most unusual forms remains the initial consideration. Tuberculosis must be considered in all children presenting with lung and mediastinal masses. The authors would like to thank A. Smyth (Consultant Paediatrician; Nottingham City Hospital, Nottingham, UK) and M. Elliott (Cardiothoracic Surgeon; Great Ormond Street Hospital, London, UK). De Backer A, Madern GC, Hakvoort-Cammel FG, Oosterhuis JW, Hazebroek FW. Mediastinal germ cell tumours: clinical aspects and outcomes in 7 children. Eur J Pediatr Surg 2006;16:318–322. Lakhoo K, Boyle M, Drake DP. Mediastinal teratomas: review of 15 paediatric cases. J Pediatr Surg 1993;28:1161–1164. Morgan DE, Sanders C, McElvein RB, Nath H, Alexander CB. Intrapulmonary teratoma: a case report and review of the literature. J Thorac Imaging 1992;7:70–77. Alper F, Kaynar H, Kantarci M, et al. Trichoptysis caused by intrapulmonary teratoma: computed tomography and magnetic resonance imaging findings. Australas Radiol 2005;49:53–56. Erasmus JJ, McAdams HP, Donnelly LF, Spritzer CE. MR imaging of mediastinal masses. Magn Reson Imaging Clin N Am 2000;8:59–89. Walls T, Shingadia D. The epidemiology of tuberculosis in Europe. Arch Dis Child 2007;92:726–729. Walia R, Hoskyns W. Tuberculous meningitis in children: problem to be addressed effectively with thorough contact tracing. Eur J Pediatr 2000;159:535–538. Romano A, Di Carlo P, Abbagnato L, et al. Pulmonary tuberculosis in Italian children by age at presentation. Minerva Pediatr 2004;56:189–195. National Institute for Health and Clinical Excellence. Tuberculosis. Clinical diagnosis and management of tuberculosis, and measures for its prevention and control. www.nice.org.uk/CG033 Date last accessed: May 20, 2008. Date last updated: March 2006. Leung AN, Muller NL, Pineda PR, FitzGerald JM. Primary tuberculosis in childhood: radiographic manifestations. Radiology 1992;182:87–91. Kim WS, Moon WK, Kim IO, et al. Pulmonary tuberculosis in children: evaluation with CT. AJR Am J Roentgenol 1997;168:1005–1009. Swingler GH, du Toit G, Andronikou S, van der ML, Zar HJ. Diagnostic accuracy of chest radiography in detecting mediastinal lymphadenopathy in suspected pulmonary tuberculosis. Arch Dis Child 2005;90:1153–1156. Jamieson DH, Cremin BJ. High resolution CT of the lungs in acute disseminated tuberculosis and a paediatric radiology perspective of the term “miliary”. Pediatr Radiol 1993;23:380–383. Andronikou S, Joseph E, Lucas S, et al. CT scanning for the detection of tuberculous mediastinal and hilar lymphadenopathy in children. Pediatr Radiol 2004;34:232–236. Ors F, Deniz O, Bozlar U, et al. High-resolution CT findings in patients with pulmonary tuberculosis: correlation with the degree of smear positivity. J Thorac Imaging 2007;22:154–159. Uysal G, Kose G, Guven A, Diren B. Magnetic resonance imaging in diagnosis of childhood central nervous system tuberculosis. Infection 2001;29:148–153. Chung MH, Lee HG, Kwon SS, Park SH. MR imaging of solitary pulmonary lesion: emphasis on tuberculomas and comparison with tumours. J Magn Reson Imaging 2000;11:629–637. Shi D, Mao X, Lian J. [Preliminary observation of MRI manifestations of adult pulmonary tuberculosis]. Zhonghua Jie He He Hu Xi Za Zhi 1997;20:107–108. Kraft SL, Dailey D, Kovach M, et al. Magnetic resonance imaging of pulmonary lesions in guinea pigs infected with Mycobacterium tuberculosis. Infect Immun 2004;72:5963–5971. Abadco DL, Steiner P. Gastric lavage is better than bronchoalveolar lavage for isolation of Mycobacterium tuberculosis in childhood pulmonary tuberculosis. Pediatr Infect Dis J 1992;11:735–738. Singh M, Moosa NV, Kumar L, Sharma M. Role of gastric lavage and broncho-alveolar lavage in the bacteriological diagnosis of childhood pulmonary tuberculosis. Indian Pediatr 2000;37:947–951. Zar HJ, Hanslo D, Apolles P, Swingler G, Hussey G. Induced sputum versus gastric lavage for microbiological confirmation of pulmonary tuberculosis in infants and young children: a prospective study. Lancet 2005;365:130–134. Wu TL, Chia JH, Kuo AJ, Su LH, Wu TS, Lai HC. Rapid identification of Mycobacteria from smear positive sputum samples by nested PCR-restriction fragment length polymorphism analysis. J Clin Microbiol 2008;46:3591–3594. Lalvani A, Millington KA. T cell-based diagnosis of childhood tuberculosis infection. Curr Opin Infect Dis 2007;20:264–271. Nsutebu E, Moffitt SJ, Mullarkey C, Schweiger MS, Collyns T, Watson JP. Use of QuantiFERON-TB Gold test in the investigation of unexplained positive tuberculin skin tests. Public Health 2008;122:1284–1287. Molicotti P, Bua A, Mela G, et al. Performance of QuantiFERON-TB testing in a tuberculosis outbreak at a primary school. J Pediatr 2008;152:585–586. Kreisel D, Arora N, Weisenberg SA, et al. Tuberculosis presenting as an endobronchial mass. J Thorac Cardiovasc Surg 2007;133:582–584. Park AH, Fowler SS, Challapalli M. Suspected foreign body aspiration in a child with endobronchial tuberculosis. Int J Pediatr Otorhinolaryngol 2000;53:67–71. Puchades RI, Alegre RM, Roch PS, Alonso ME, Esteban Hernandez JM. [Progressive primary tuberculosis with endobronchial involvement. Benefits of multislice helical computed tomography]. An Pediatr (Barc) 2006;64:388–391. Moreira JS, Camargo JJ, Felicetti JC, Goldenfun PR, Moreira AL, Porto NS. Lung abscess: analysis of 252 consecutive cases diagnosed between 1968 and 2004. J Bras Pneumol 2006;32:136–143. Hammond JM, Potgieter PD, Hanslo D, Scott H, Roditi D. The etiology and antimicrobial susceptibility patterns of microorganisms in acute community-acquired lung abscess. Chest 1995;108:937–941.